“It isn’t that life ashore is distasteful to me. This continues a series of articles explaining the terms travel agents might use on an unsuspecting client. If you have not cruised before this might help you find your way around a cruise ship – or even a brochure. I decided to divide the world of cruising into two parts. This week I will show you around the accommodations. Another time soon we will look into dining! Please let me know if I have left out something you found unique or curious in your sailings. Cabin/Stateroom – Equivalent to your hotel room, this is where you sleep, bathe, change, and spend time. Some clients ask to book the least expensive cabin, saying “We won’t spend that much time in the cabin anyway.” I take another view and enjoy being in my cabin. I love having a nice view with a balcony if at all possible. It can be a very inviting space where you would choose to spend free time. Suite (junior suite, family suite, Owner’s suite) – As in a hotel, a suite of any sort includes a living room type space; this gives you someplace to sit besides your bed! Some ships call themselves “all suites” but are primarily junior suites with a handful of genuine (separate living room) suites. The junior suites provide a small sofa and space for having breakfast in your cabin. Suites come in all sizes. Family suites can sleep up to five people. The posh units can have additional bedrooms and bathrooms, a dining room, living room, and a very large balcony. Balcony/Verandah – Many cabins have a floor-to-ceiling window and door to their own outdoor space, large enough for two chairs and a small table. These balconies (some cruise lines call them verandahs) are wonderful in fair weather destinations. You can have a romantic breakfast (or other meals or wine) here, or just watch the life of the port or the sea as you enjoy the fresh air. Your section of balcony is visually separated from neighbors but you can hear each other easily. French Balcony – Also called a Juliet balcony or waving balcony, these offer a sliding door and great views but there is not enough room to stand on them. You can lean against the railing and wave – or blow kisses to your lover. This Balcony Suite on the Seabourn Legend has a French balcony at the right end of this floor plan. Inside Cabin – These have no windows to the outside. They are the least expensive cabins. Outside or Ocean View Cabins – These have a window (not a porthole) so you can see out to daylight and whatever view is available. The window does not open. 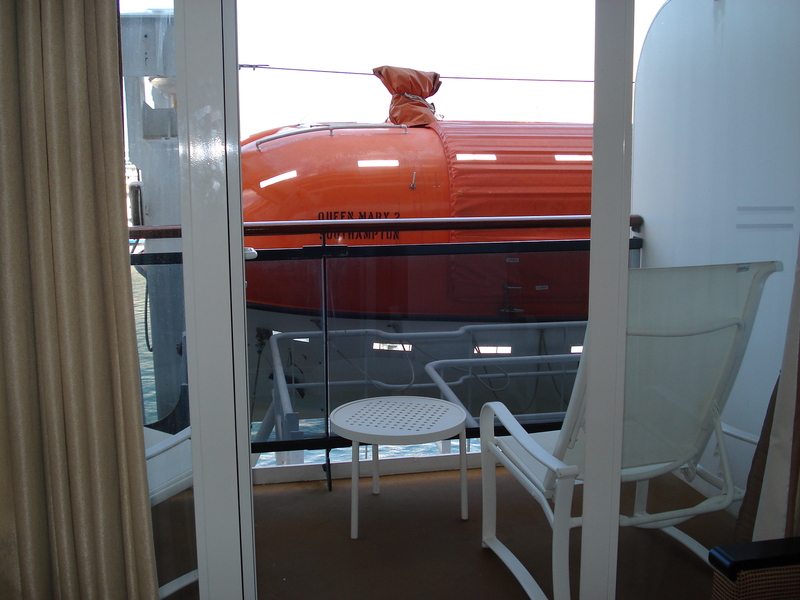 Obstructed View Cabin – These outside cabins have a window (or even a balcony) but they also have something which blocks the view (usually a lifeboat). You do get some daylight but the view is significantly less attractive than in non-obstructed cabins. That’s why these cabins are the cheapest of the outside cabins. This is a lovely balcony space but the view is seriously compromised by the lifeboat! Cabin Stewards take care of your cabin while you are not looking. Your steward will greet you soon after you arrive and show you the special features of your space. This person or his/her partner will tidy and refresh your space when you are away. It is a luxury VERY easy to grow fond of. You will see them in the passageways (halls) and wish you could take them home with you at the end of the voyage. Posh now means elegant, fashionable, and expensive. Back in the glory days of the British Empire it was the acronym for Port Out Starboard Home. Going to India on a ship (how else?) you had better views if you had cabins on the port/left side of the ship going and on the starboard/right side as you sailed home. This entry was posted in Travel, Uncategorized and tagged aft, amidships, balcony, cabins, cruise, fore, junior suite, obstructed view, port, starboard, suite, travel, travel agent. Bookmark the permalink.